I feel like I have been so busy, but, don’t seem to have much to show for it. The patchwork group Iam a member of, had an Easter Exhibition. I entered three of my quilts, and also entered the challenge section. The Challenge was to use some or all of two pieces of the fabrics participants were given, and make a wallhanging around the theme, which was ‘Lighting up Bendigo’s Icons’. I chose to Depict Father Henry Backhaus, who came to Bendigo in the Gold mining Era. 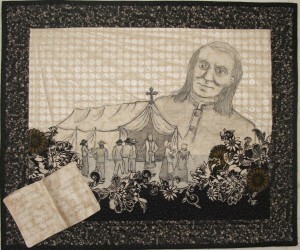 On the wallhanging I have shown him overlooking his tent chapel, the precursor to St. Killians Church which he founded. Machine embroidery, pencil, fabric marker, raw edge applique.